and the beat goes on......Wow! ^ Yeah, it's amazing. This is the 3rd new project I've heard about today alone. BTW, Ridpath's property extends all the way back to McMurrich St. 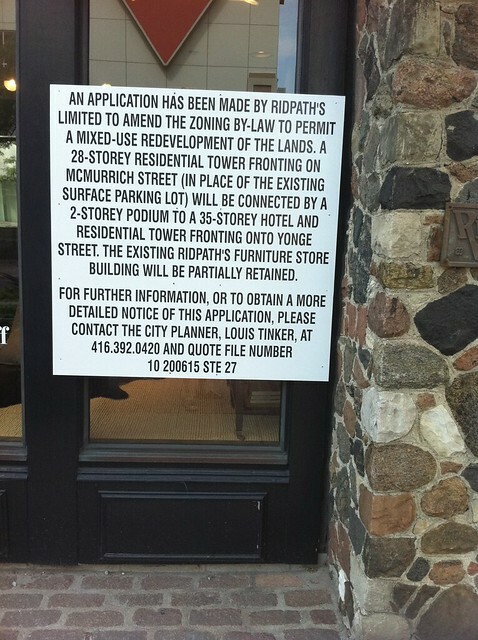 Thank goodness the Ridpath building will be incorporated and not replaced. Rezoning application to permit the redevelopment of the lands for the purposes of a hotel and resdiential development consisting of 28 and 35 storey towers atop a two storey podium complete with parking spacs below grade and three loading spaces. The proposal includes the partial rentention of the historically listed Ridpath's furniture store building. Seems good. Retains the historic buildings and adds density at an acceptable height for the neighbourhood. Didn't the Ridpaths store originally expand laterally, i.e. into the 920 Yonge podium space that's now occupied by Christine's Fitness? Don't tell me you forgot about the lovely Milan condos designed by E.I.Richmond? I didn't forget about Milan. I mean the actual Canadian Tire building, including C.Tire parking garage and gas bar site. how long and wide is this property to be able to fit 2 towers? I'm thinking a 28s boutique hotel behind the Ridpath's facade and a 35s residential condo facing McMurrich Street. The 35-storey tower would be one of the slenderest in the city - less than 50 feet wide north-south.